1961-62 Parkhurst Hockey saw some changes from previous years. Actually, the fronts are similar but the amount of information included on the back was scaled back drastically and replaced by a novelty. For many critics, that change showed the beginning of the end of the company's offerings. Card fronts show a player image superimposed against a background color. The background also contains the player's team logo shown several times over. A black box along the bottom contains the card number and the player's name, with a white border surrounding the card. Backs are written in both French and English. A note along the top identifies the cards' year of issue, and the player's name is presented in a bold font beneath that. His stats from the previous year follow. After that, a large cartoon takes up the rest of the card, with a punchline that can be revealed by rubbing the edge of a coin along the surface. Needless to say, a card that has been scratched loses some of its value. 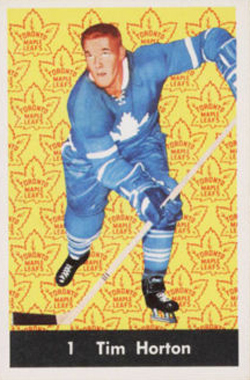 There are 51 cards in the complete 1961-62 Parkhurst Hockey set. The checklist is broken down among three of the NHL's teams. The Toronto Maple Leafs appear on cards 1 through 18, the Detroit Red Wings are on cards 19 through 34 and the Montreal Canadiens take up the rest of the set. Unlike previous Parkhurst sets, there are no coaches, action cards or specialty subsets. The only notable rookie in 1961-62 Parkhurst Hockey is Dave Keon. 1961-62 Parkhurst # 20 Gord Howe Low Grade.